Distribution: Abalone is found along the rocky shores from mid New South Wales down and around to Western Australia. 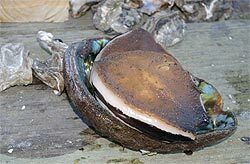 Description: Abalone is an edible mollusc ,endemic to Australia. It is considered a delicacy. It has a single, ear-shaped shell lined with mother of pearl. The foot of the abalone has a distinct black lip that gives this species its name. The body whorl has a series of holes—four to ten depending on the species—near the anterior margin, for the escape of water from the gills. There is no operculum. 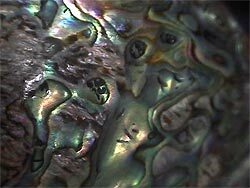 The iridescent nacre that lines the inside of the shell varies in color from silvery white, to pink, red and green-red, through deep blues, greens and purples. Ecology: Abalone grow in shallow waters and averages around 8cm, while shells found in deeper water grow to around 14cm. Growth rates vary seasonally and with location. Blacklip abalone can grow to at least 21cm in length. Abalone adheres itself to rocks, so a tool called an "abiron" is used to dislodge it. An abiron is similar to a paint scraper. Blacklip Abalone are herbivourous and graze on seagrass leaves and algae growing on rocks using their rasping radual tougue.Their diet is dominated by red algae. They are preyed upon by crabs, starfish, stingrays, wobbegong sharks and possibly rock lobsters. Interesting facts: Abalones reach maturity at a relatively small size. Their reproduce more eggs as they mature incresing from 10,000 to 11 million eggs at a time. The shell of the abalone is exceptionally strong. It is made of microscopic calcium carbonate tiles stacked like bricks. Between the layers of shells is a clingy protein substance. Status: Abalone has long been a valuable food source for humans in every area of the world where a species is, or used to be, abundant. The various larger species of abalones have been exploited commercially for food to the extent that many populations are now severely threatened. The highly iridescent inner nacre layer of the shell of abalone has traditionally been used as a decorative item in jewelry, buttons, and as inlay in furniture and in musical instruments such as guitars.State regulations set bag limits and minimum size limits for abalone caught by recreational fishers. In Western Australia abalone may only be taken by divers using snorkelling gear.